Anne Zahalka's career spans more than 20 years and she has exhibited widely in Australia and internationally most recently as part of the Australian exhibition 'Supernatural artificial' at the Tokyo Metropolitan Museum of Photography, Japan in 2004, 'Fieldwork: Australian art 1968-2002', National Gallery of Victoria 2002, and 'Photographica Australis' which toured Asia extensively 2002-2003. Zahalka has, from very early in her career, been particularly interested in issues of identity and matters of representation. In the 1980s she frequently deconstructed historical images. By the 1990s, Zahalka's work turned to modern urban environments where the issue of the modern identity remained paramount. This has continued through her various series such as 'Open house' 1995 and 'Fortresses and frontiers' 2000. 'Woodchop stadium' 1999 is, along with 'Cole classic' 1998, one of Zahalka's earlier images in the 'Leisureland' series which went on to encompass indoor and outdoor worlds such as casinos, gyms, museums, a lecture by Derrida, as well as the Easter show. 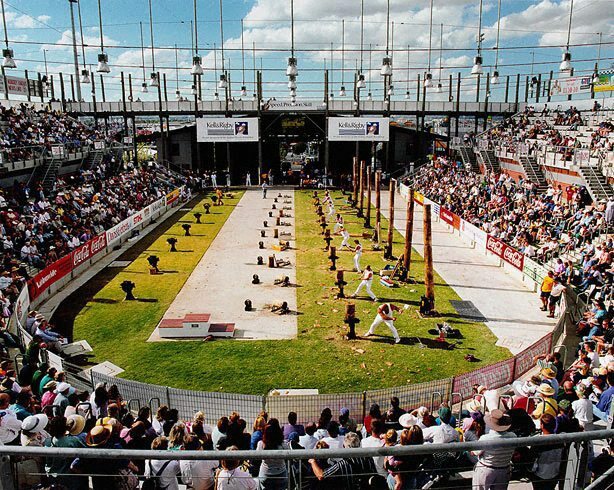 The image features strongman David Foster, one of the reigning woodchop champions, in the amphitheatre purpose built for the competitions. The image was shot on negative film, scanned and then output as a lightjet print. Signed label l.c. verso frame, ink "Anne Zahalka". Not dated.